This is a large example covering many basic uses of maps, positioning, and navigation services in Qt Location. This page is divided into sections covering each of these areas of functionality with snippets from the code. Drawing a map on-screen is accomplished using the Map type, as shown below. In this example, we give the map an initial center coordinate with a set latitude and longitude. We also set the initial zoom level to 50% (halfway between the maximum and minimum). To locate a certain address or place on the map uses a process called geocoding. In order to perform a geocode operation, we first need to adjust our Map object to be able to receive the result. With these three objects, we have enough to receive Geocode responses and display them on our Map. The final piece is to send the actual Geocode request. To send a geocode request, first we create an Address object, and fill it in with the desired parameters. Then we set "geocodeModel.query" to the filled in Address, and call update() on the GeocodeModel. 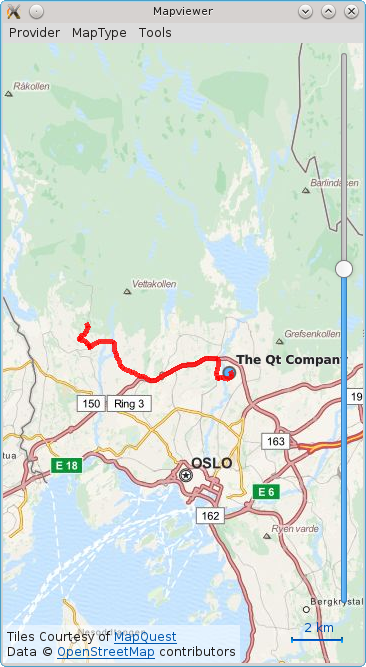 Similar to the GeocodeModel, Qt Location also features the RouteModel type, which allows information about routes (for example driving directions) between two or more points, to be received and used with a Map. In the next snippet, we show how to set up the request object and instruct the model to update. We also instruct the map to center on the start coordinate for our routing request.